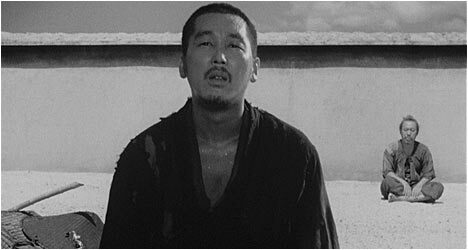 When Akira Kurosawa made Rashomon (1950), he had left Toho Studios and made movies for three other companies before returning. It was with one of these other studios that the director made this film, but it wasn’t easy. He had a hell of a time getting funding because executives were worried that the project wouldn’t be accessible to mainstream audiences. Fortunately, they trusted his instincts and Rashomon went onto become one of their most commercially successful films that year. It also won top prize at the 1951 Venice Film Festival and the Academy Award for Best Foreign Film, establishing Kurosawa’s international reputation as a master filmmaker. Two men sit dumbfounded by a story they heard about a man that had been murdered. The one is so shaken that he says, “This time, I may finally lose my faith in the human soul.” They recount the “horrible” story to a third man (Ueda) who has joined them while waiting out the torrential rain in the hopes that maybe he’ll help them understand it. The one man is a Woodcutter (Shimura) and he goes first. One day, he was walking through a forest when he found articles of clothing that led to a dead body (Mori). The second man, a priest (Chiaki), knew the man and had met him three days prior to his death. A notorious bandit (Mifune) was found with several of the dead man’s belongings and he too tells his side of the story. We find out that the dead man’s wife (Kyo) had been raped in the forest. The series of events leading up to it are recounted by the Woodcutter, the bandit, the woman, and the spirit of the dead man. It is up to us to fit this altogether like some kind of cinematic jigsaw puzzle. Who is telling the truth? Somewhere in each of their stories are aspects of what really happened but we will never know for sure because it is hard to separate the truth from the lies. At the time, Kurosawa’s non-linear narrative was considered groundbreaking because no one had thought to tell a story like that before. Characters’ egos, vanity and an innate instinct for self-preservation cloud the truth so that we are constantly trying to figure out what really happened. Kurosawa used every cinematic weapon in his arsenal to expertly tell this story from several different points of view, employing devastating close-ups, exhilarating tracking shots, and masterful editing. As the DVD liner notes point out, Rashomon put Kurosawa in the big leagues where he was regarded as highly as Ingmar Bergman, Federico Fellini, Michelangelo Antonioni and others. He had finally arrived on an international level where his reputation only grew over the years. There is an audio commentary by film critic and historian Donald Ritchie. He starts off with detailed analysis of the Rashomon’s style and themes and how they work together. He points out the actors that were regulars in Kurosawa’s films. Ritchie also mentions how the real look of the film was in contrast to the questioning of reality from the different character points of view. This is an informative track. “Robert Altman on Rashomon” features the late great filmmaker talking about his admiration for this film. He points out that we have to question everything we see in the film and how it changed his perception of film and art in general. “The World of Kazuo Miyagawa” features excerpts from a television documentary on this legendary Japanese cinematographer. He worked with the top directors in Japan on 134 feature films. Naturally, these clips focus on his work with Kurosawa on Rashomon. “A Testimony is an Image” is a 68-minute documentary that reunites key crew members as they reminisce about working on the film and with Kurosawa. They talk about getting involved in the project and recount filming anecdotes. “Interview with Takashi Shimura” is an audio interview from 1961 with the legendary Japanese actor. He gives his impressions on working with Kurosawa and how the director dealt with actors. Finally, there is a three minute trailer for the film.